HYGIENE SYSTEM, 1997. 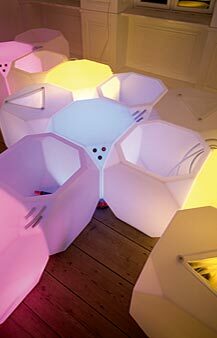 Music for HYGIENE SYSTEM by Anders Remmer. The HYGIENE SYSTEM enables persons to have their needs for personal hygiene satisfied. This version of the system consists of three parts: a toilet module, a bathing module, and a supply module. The system is constructed in such a way that anybody is capable of installing and using it. The volume is minimized and, when in use, the system takes up only approx. 1.4 m�; after use, the system can be stacked, and it takes up only 0.36 m�. The simple construction has made it possible to use few components with a low degree of manufacturing. At the same time, the HYGIENE SYSTEM is easy to clean and it is very durable. This version of the HYGIENE SYSTEM is intended to operate under very simple conditions, and for easy installation in existing buildings. The HYGIENE SYSTEM is constructed by using three polyethylene (PE) plastic tanks of equal size. The tanks are not fixed to the ground or to each other, and can be easily moved or stacked The system requires no plumbing, and it uses only soft flexible tubes for the water supply and drainage. 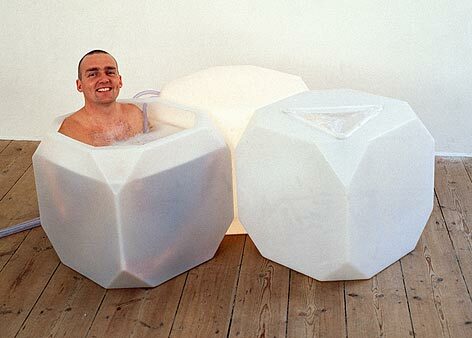 The bathing module is mainly intended for bathing or showering, in both cases in a sitting position. Since the module has no plughole, it may be placed anywhere one prefers, e.g. directly on the floor, and stacked away after use. This makes it possible to have a pleasant bath even in very small rooms, which were not originally meant for this type of activity. 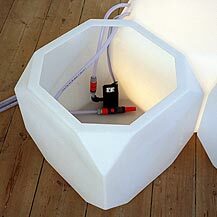 A pump placed inside the bathing module removes the water after use The supply module leads water and electricity to the bathing module and at the same time it functions as a table and a lamp. In the toilet module, a biodegradable PE plastic bag is used instead of water to carry away the urine and faeces. The toilet module consists of three parts: 1) a PE tank with a triangular cut-out for sitting on while using the toilet; 2) a PE bag placed in the triangular hole is used to catch faeces, urine, paper, and water from washing one's hands. Instantly after use, the bag is shut by pressing out excess air, letting the bag rotate a few times and making a knot; 3) a transport unit in which the bag can be transported safely. The transport unit is kept inside the toilet module and lifted up for use. The bag can be disposed of in many ways, depending on the local environment. 1) The bag can be buried in the ground or composted in an insulated tank, whereby the bag and contents will be degraded with the help of biological processes. After three to six months, the product can be used as a fertiliser in food production. If burying is chosen, one should be aware that a temperature that is sufficiently high to kill all micro-organisms can only be achieved at the centre of the sludge. 2) The bag can be burned at a high temperature whereby odours and risks of infection are eliminated. By using this method, the ashes can be used immediately as a fertiliser. 3) The content of the bag may be dried in the sun, whereby it is dehydrated and the volume is reduced. Hereafter it may be spread on a field. This method could cause some odour inconveniences. If none of these alternatives are applicable, a further possibility would be centralised collection and burning, although some of the advantages of the system would then be lost because in this way, one ends up concentrating the sludge, causing risks of infection and over-fertilisation. If the sludge is to be collected, these problems must be solved. The transportation must be done safely and the ashes should be redistributed locally for fertilising purposes. The sludge could also be treated in a biogas plant that returns energy in the form of methane gas. The advantages of this toilet are partly that it uses no water for waste transportation and partly that it is very hygienic compared to other dry closets. Finally, the toilet makes it possible to keep viruses, bacteria, and nutrients local. A water closet produces aerosols during the flushing process whereby micro organisms and particles are spread in the air. A normal water closet uses 6-15 liters of water every time it is flushed. Hereafter the sludge passes through an expensive sewage system that demands a lot of maintenance, before it is concentrated, causing problems with bacteria, viruses, and nutrients. The dehydrated excrement of an adult man amounts to about 38 liters a year Every time a water closet is flushed, 6-15 liters of pure drinking water are transformed into polluted sewage, which will contain nutrients and micro- organisms, even after treatment. Low-flush toilets still spend 3.5-4 liters and cause problems with clogged sewage pipes. The supply module uses the same PE tank as the toilet module. It administers the supply of water and electricity to the HYGIENE SYSTEM. The electric system transforms 220 V supply into 24 V using a security transformer. The transformer must be placed far from the hygiene system. In order to light up the supply module, a 24 V/36 W truck lamp is placed at the centre. The lamp is connected to the same circuit as the drain pump. Because of the semitransparent sides of the supply module, the toilet module as well as the bathing module and the surrounding room are illuminated. The low voltage power supply is used in order to prevent accidents. Supply of fresh water as well as transport of used water is carried out via flexible transparent tubes which can be pulled in and out of the supply module. All tubes are connected with quick couplings that are easy to handle without the use of tools. The tubes are accessible so that leaks can easily be located and repaired. This version of the supply module uses an externally placed heater to supply hot water. If no such heater exists, a flow heater can be installed inside the module. Otherwise, the supply module can be connected to a solar heater, as mentioned in "Extra equipment". Problems with legionella bacteria are avoided by using a flow heater, as well as the energy loss that follows when storing hot water in a tank. Furthermore, one will not suddenly run out of hot water. If a solar heater is used, the tank must be sterilised regularly or a UV filter may be connected. If one does not have access to water from waterworks, a tank for collecting rain water can be connected. If one has no electricity for the drain pump, the drain problem must be solved with a simple plug hole in the bottom of the bathing module. Washing water, because of its low degree of pollution, may simply be let out on the ground, if allowed by the surrounding conditions. The bathing module is constructed from the same PE tank as the other modules. Its dimensions are adjusted so that even very tall persons can sit comfortably inside it. Very overweight persons may need a larger module, though. The bathing module serves three main purposes: as a shower, a bathtub and a sink for hand washing As a bathtub, it has the following advantages: firstly, it does not demand as much water as an ordinary bathtub since much of the volume is filled by the bathing person's body; secondly, it is easy to keep clean; and, finally, it offers some pleasant experiences because of the semitransparent sides and the light that illuminates the water Generally speaking, a bath is more hygienic than a shower; it offers more relaxation and may reduce stress. A more thorough cleaning of the body is achieved by long stay in hot water, dirt is dissolved and dead skin cells are removed. Because of the high efficiency, one does not have to take a bath very often. In general, bathing uses more water that showering, but on a total basis this system saves water because of the dry toilet. If showering is preferred, the bathing module is equipped with a variable spray device that atomises the water and minimizes the use of it. A 24 V pump is mounted inside the bathing module to pump out the water after the bath or shower. Draining the bathing module takes approx. 5 minutes. When the tank is empty, the quick-coupling is disconnected before shutting the pump off, in order to keep the water from flowing back. The bathing module can also be used as a sink, although for hygienic reasons, the PE plastic bag is better suited for this purpose. A solar heater, flow heater, solar power panels and accumulators may be added to the HYGIENE SYSTEM as well as extra bathing and toilet modules, in order to make it possible for more persons to use the system at the same time. The HYGIENE SYSTEM needs supply of hot and cold water, as well as electricity. Furthermore, a way of getting rid of the drain water must be found, either by the use of existing drain pipes, pouring the water directly out on the ground, or by directing it through a cleaning system The system is modular, it can easily be adjusted to existing rooms, and it is easily transported and stored. The HYGIENE SYSTEM is able to resist bumps and strokes without being damaged since the materials are mainly PE low density As the system can be dismantled completely without the use of tools, it is easy to install and maintain. It may be necessary to use conversion links between the tubes of the HYGIENE SYSTEM and the existing pipes one finds in a building. The PE-tanks are easy to clean and tolerate most cleaning remedies. If one wants to avoid the use of chemicals, a micro-fibre cloth and some water is sufficient for most cleaning tasks. In special cases, small amounts of methylated spirits may be used as disinfectant. Cleaning remedies are kept in a container that also functions as a bucket. It is placed at the bottom of the toilet module next to the transport container. The coarse pre-filter, attached behind the pump's suction grille, should be rinsed frequently under running water. Total weight: approximately 25 kg. 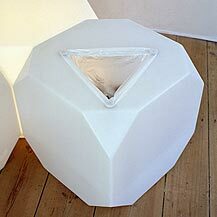 Dimensions: 3 modules, 600 x 600 x 600 mm each. Electricity (present configuration): light bulb 36 W, pump 28 W.
HYGIENE SYSTEM - EXTENDED, Copenhagen, Denmark 1998.